Our Professional Series 4 In 1 Buckets come in various styles and options. You can choose from smooth edge, weld on teeth or a bolt on tooth bar. Please select the type and size you would like before adding to cart. Our Professional Series 4 in 1 Combination Buckets are versatile attachments for your skid steer and are ideal for grappling, dozing, backfilling, loading, digging and fine grading. The cylinders on these 4 in 1 Combination Buckets have a 2.5" bore by 8" stroke. 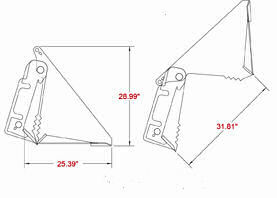 The buckets also come equipped with a 3/4” x 6” cutting edge and 1/2” x 4” at all other ground engaging points. They are also built with top quality steel, oversized points and bushings and with grease fittings at every pivot point. Every unit exceeds the lifting capacity of the skid steer machine it is used on.